Everyone here gave the wildcard spot to Acadia, with most placing them 8th. The No. 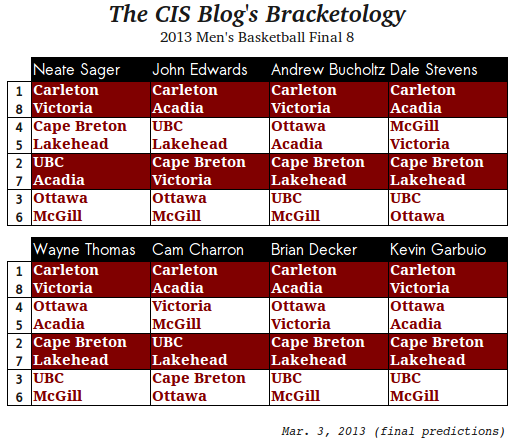 2 seed in our scenarios will always go to Cape Breton or UBC, and McGill is a popular choice for the No. 6 spot (the lowest they can be, by rule, as a conference champion). Why is Cam Charron even included in this if he's simply going to be a Canada West homer and not take it seriously? You don't like UVic at 4? They did beat UBC twice. Dale Stevens put them at 5. Neate Sager had all the right match-ups....just at the wrong seeds. Other then that, most people had either UBC and Ottawa switched or Acadia and UVic....and Cam Charron is ridiculous with his picks, quite embarrassing actually.